Accolades are a consequence, not a goal. This really reminds you how amazing this season is. It's interesting that we've been top for pretty much all of the season and shows that city have a pretty difficult run in. That just means they have had an easier season than us so far. I can feel Screamin J Hawkins possesing me. What really strikes me is that we have beaten par 5 times and dropped points to par only 3 times. City have also beaten par 5 times but have dropped points to par 5 times. They have to beat par two more times than us in the remaining games (on the big assumption that we win all of it remaining games) in order to overtake us. Of the 3 we've dropped to par ... two were against City (h & a) and the other was Leicester at home. 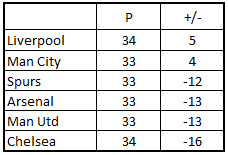 The reds with by far their hardest game remaining against a somewhat resurgent Chelsea at Anfield. A win here would likely make us favourites for the run in regardless of City's result at Palace. City have a tough away game against Palace who have done a number on them in the past. However, it is still a game you'd expect City to win. 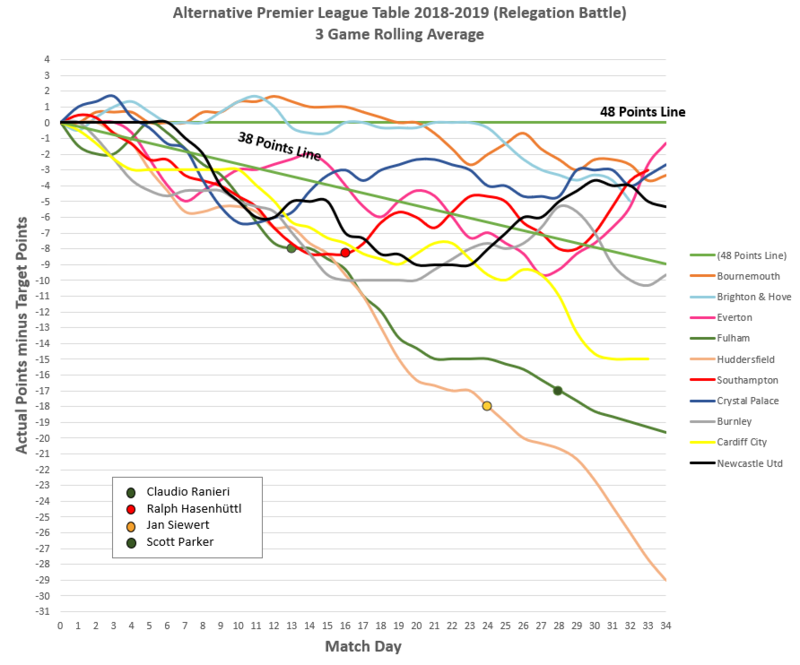 Spurs and United have what should be run-of-the-mill home games for a top 4 chasing side although dropping points wouldn't be fatal for either on the APLT. Arsenal have a tricky par 3 which could see them drop down to 6th in the APLT if they don't get a win. Chelsea can get in to the top 4 both on the APLT and be in a strong position in the real table with a result at Anfield. We don't have a great recent record against Chelsea at Anfield. We haven't beaten them at home for very nearly 7 years. Maybe we're due a change? So neck and neck now? No, it’s 5 to 4 now. 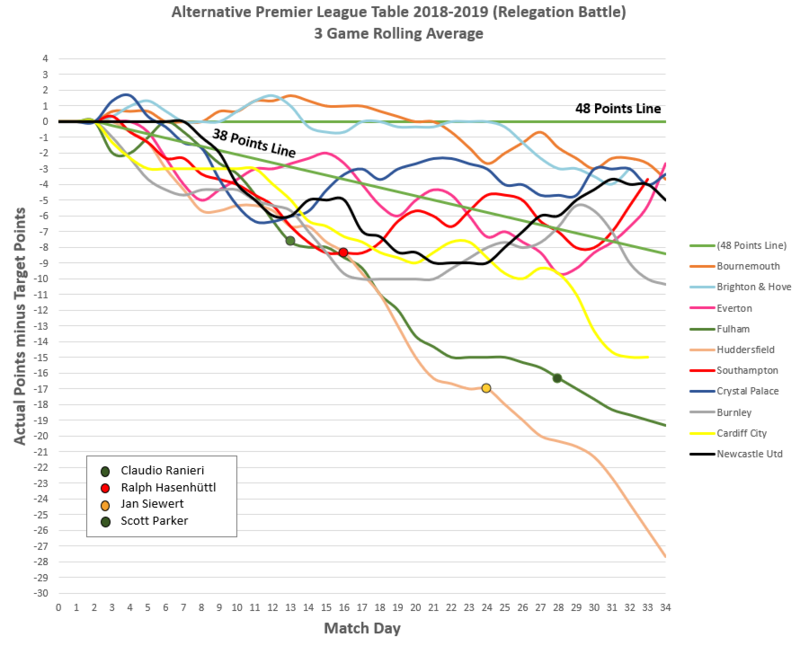 Sorry guys, been a bit sparse with these recently but here's the latest update, I haven't included one of the graphs because frankly it's a nightmare to read, these should be good enough though. edit: updated 2nd graph as per Drmick's post. Where's that squeaking noise coming from? 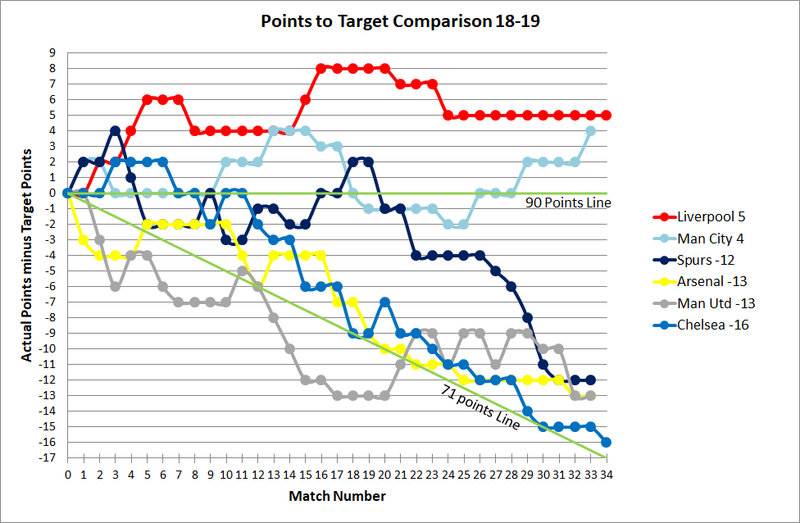 On the bottom 3 game rolling average graph- shouldn't have Everton' s defeat to Fulham produced a drop or flattening? It's getting pretty tight at the top. This is crazy. 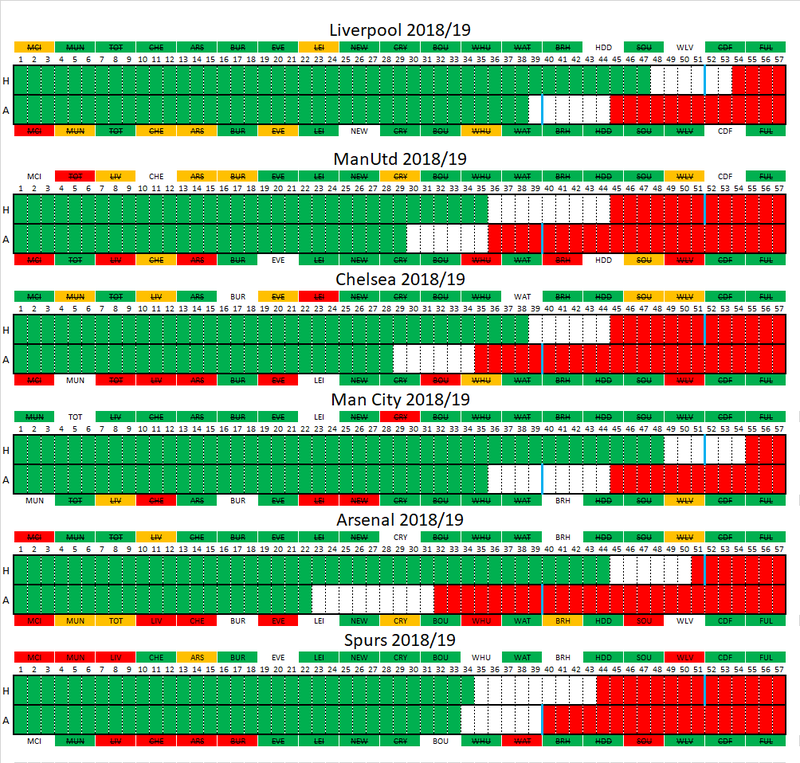 Unsure playing to par until the end of season would secure the title for Liverpool. If City win at Old Trafford they would go up to +6 wouldn't they? Assuming that's their last par 1? If City win at Old Trafford they would go up to +6 wouldn't they? Assuming that's their last chance to make up ground. Burnley as well. We would get +2 for Newcastle. Ah, okay. So should we both win all our games we'd end up on +8 and +7. You're right, looking at the formulas, it was referencing the 3 games prior to week 34 and not the 3 games including week 34. I suspect the formulas may also have affected some of the other rows as well so I copied and dragged the amended formula for all teams. Here's the amended one. 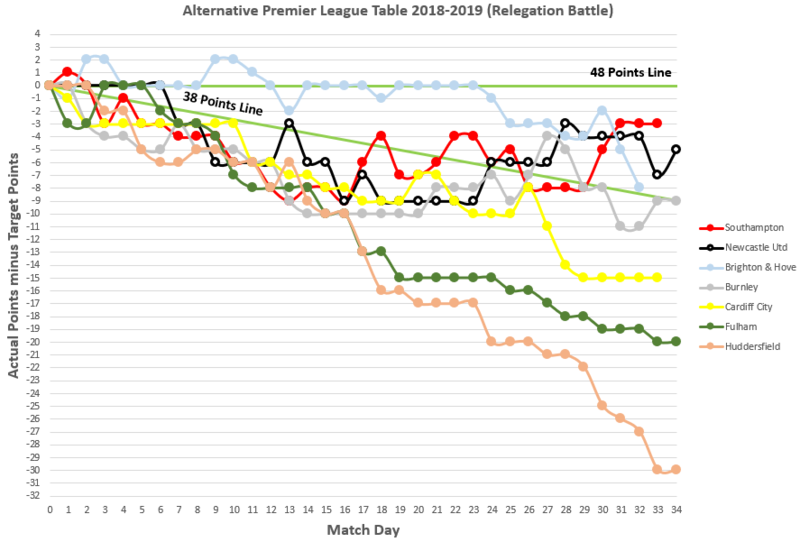 I think the relegation model is quite decent still. If either of the two need fixing it'd the title-winning one! Do we think all 6 teams finish above the 71 points line? Cardiff have some raised hope by beating Brighton. Let's hope they're not too enthusiastic when we visit them. Looking at their position on the ALTP they are well fooked - they play us and United. Liverpool go to Cardiff knowing a win will keep them top of the real table and the APLT. Whereas City host Spurs knowing that anything but a win might leave them second until the end of the season. Spurs go to City with something of a free hit, a loss still keeping them at least joint 3rd on the APLT. Any other result will keep Spurs a comfortable 3rd with room to spare for any possible CL fixtures. Arsenal has a home game against Palace which you'd expect a team with their home record to see through and cement their top 4 standing. United have a tough away trip to Everton which they need points from in order to keep the pressure on Arsenal. A win will see them overtake Arsenal on the APLT and jump to 3rd. Chelsea must beat Burnley at home or they are all but out of the top 4 race. at this stage of the season and with the breakaway the two of us have had, it is just binary. The plus and minus value of games barely exists at this stage, in an unusual way, like rarely happens in our league. This probably happened some time in February.